ChiliBlue Backpackers i Sydney, Australien: Reservér nu! Whether you are coming for one night or staying long term, you will find that our youth hostel will provide a warm, comfortable, home away from home. Located on beautiful Victoria Street, we are moments away from the nightlife of Kings Cross and the rest of central Sydney. If you are traveling alone there is always someone here who is up for going out! We offer tons of freebies, such as free weekly events. 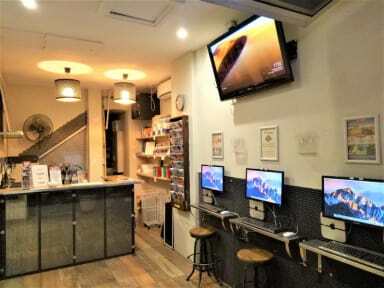 We have free unlimited Internet and WiFi, free walking tours, free cable TV and some of the cheapest rates in Sydney! Ask at our tours desk about our free deals with local pubs and clubs! 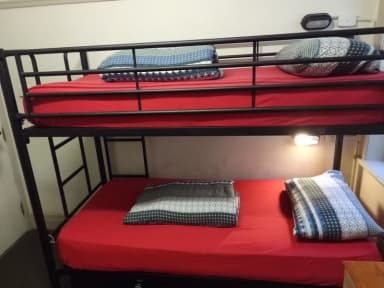 Our hostel offers Budget Doubles with duvets and blankets which can accommodate a maximum of 3 people, Dorm rooms (from 4 to 10 beds, loads of space), twins and triples are also available; the triple is a double bed with a single bunk on top. Some dorms have balconies and city views. Private rooms have their own mini-fridge, TV and DVD player. Feel at home and cook a meal in our modern, fully equipped kitchen. There’s also a courtyard with a large communal table and winter heating. Chili Blue offers plenty of chill-out space to read, sleep or drink. We have Foxtel cable TV - with all the bells and whistles! Watch your favorite movie, TV show (on Fox), or sport on a huge TV - open 24 hrs. Free bag storage is available for a standard sized bag (one per person) on the day of departure only. Please check with reception for details. If you are planning to extend your stay in Sydney, we can assist you in the search for a job in your preferred industry for the duration of your stay. Our hostel provides accommodation to international passport-holders only. Security is a priority for us and we operate a secure key-card entry system. We offer free late check-out until 11 am and free early check-in! Chili Blue is a great place from which to base your adventures in Sydney or to come home to after a long day/night. Please note that our hostel is a youth hostel and is not suitable nor comfortable for older guests; we do not accept guests over 30 years old. If clean and tidy is what you are looking, find some place else! The room smelled weird, and the floor, shelf and bed was dirty. The paint was coming of the walls, and there was no bathroom on my floor. It is cheap, but I would prefer to spend a few more dollars and get a more decent place.